The European Ryder Cup skipper, who hit the opening tee shot in the qualifying campaign for his team on Thursday morning, defied a tough course set up and blustery winds to card a two under 69 that leaves him just two shots behind Welsh pacesetter Liam Bond on three under oar. Tied for fourth but with just five shots covering the top 32 on the leaderboard, the 46 year old Dubliner knows he must follow up with a solid third round or get swallowed up by the pack. David Higgins shot a fine 70 to make the cut in Wales. 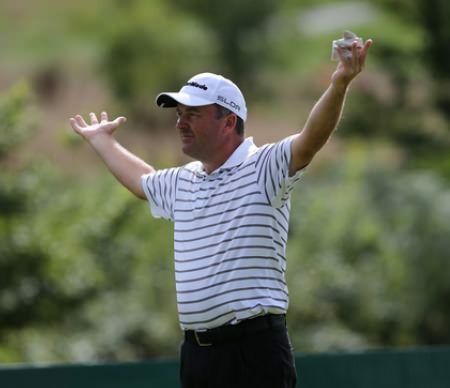 Picture: David Lloyd / www.golffile.ie“I played lovely control golf,” McGinley said after a round featuring four birdies and just two dropped shots. “Hopefully the wind will blow a little bit at the weekend. I think that’s going to make it tough. “I think it’s a tough course anyway but it’s very bunched as most fields are now on The European Tour. You are going to have probably eight shots between the leader again and the cut all very bunched. McGinley won a Wales Open reduced to just 36 holes in 2001 but that was on the Wentworth Hills Course and he confessed that he only truly learned how to conquer the TwentyTen course by watching the players dismantle it in the Ryder Cup. “It’s a really strongly designed golf course, a lot of water and hazards and if you’re a little off-line, you can get in some serious trouble,” he said. 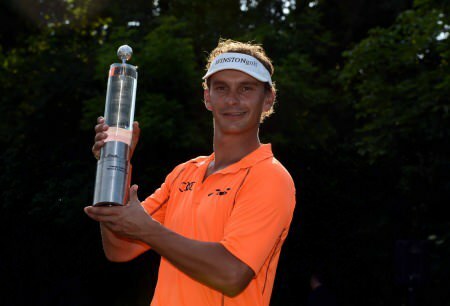 “I played well here last year [T6]. Ranked 156th in the Race to Dubai, McGinley would love to make a late season run for The Final Series of events on the European Tour. 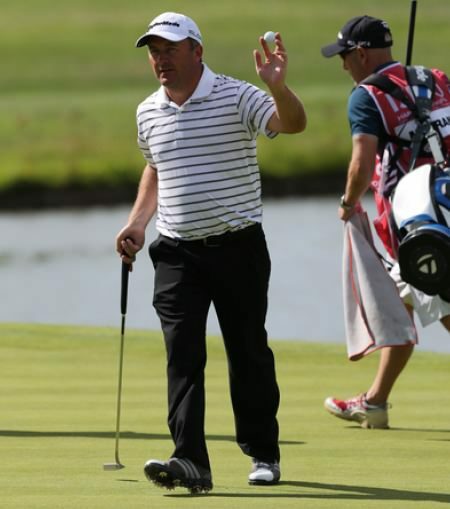 Damien McGrane needs a good week and could have it at Celtic Manor. Picture: David Lloyd / www.golffile.ieJust four of the seven Irish players in the field managed to make the cut with Damien McGrane, struggling to keep his card at 111th in the Race to Dubai, tied for 11th on one under after a battling 71. David Higgins, who is 182nd in the money list, revelled in the wind and posted a fine, one under 70 to make it on two over par with Gareth Maybin (75) sneaking in on the four over par mark. Leader Bond took full advantage of a last-minute invite to soar to the top of the leaderboard as he aims to become the tournament’s first home winner. The Welshman, who lives ten minutes from the famous Celtic Manor Resort and is the touring professional at the nearby St Pierre Golf Club, carded a solid three under par second round of 68 on a day when many struggled with the difficult conditions and tough pins. One of those was first round leader Espen Kofstad, who sits in tied second place alongside Tjaart Van der Walt having followed up an opening 64 with a three over par 74. McGinley was joined in fourth place by France’s Grégory Bourdy (73), Spaniard Rafa Cabrera-Bello (68), Englishman Graeme Storm (67) and American Peter Uihlein (70). Simon Thornton shot a 71 but just missed the cut on five over while Peter Lawrie was four outside the mark after a 77. Darren Clarke, who had a horror finish to post a 78 on Thursday, finished on nine over after a 73. Darren Clarke could only scratch his head at his poor finish. Picture: David Lloyd / www.golffile.ieRyder Cup skipper Paul McGinley led by example in the first European Tour qualifying event for his 2014 side but Darren Clarke could not have made a worse start.